Do you get struck up in getting the exact words in Hindi or English when speaking to people? If yes , here’s an Windows Phone app “Shabdkosh App on Windows‏ Phone” that lets you get your vocabulary right in Hindi or English and also know the meaning of the words that you don’t understand. 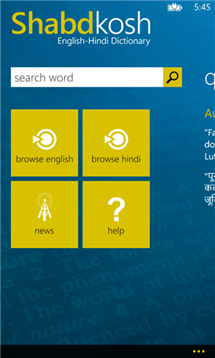 The Shabdkosh App allows the users to search words from English to Hindi and vice versa. If there are some words that you have never heard before and find it difficult to pronounce, Shabdkosh App has a feature called “spoken pronunciations” which lets you understand and get it right. Shabdkosh App on Windows‏ Phone 8 is available for download from Windows Phone Store.